Potosí: The saddest place in South America? Candelaria mine, Cerro Rico, Potosí, Bolivia. The mines – which have claimed millions of lives – are still being worked today. We’ve just spent our third Christmas and new year away from home. As we’re living in a proper house and have been temporarily adopted by Emma, Rolando and family, it was more like a ‘normal’ Christmas than the others. There was the build-up, with drinks parties, visits from Santa (one of which looked suspiciously like JD…) , and even some shopping for presents. There was turkey and bread sauce, there were roast potatoes, and there were Boxing Day leftovers. New year’s eve involved way too many cocktails. So no change there then. But that’s enough of the happy smiley Santa stories – it’s the 5th of January and we’ve all had enough of that, so we’ll move straight on to the gritty stuff. A story of colonial brutality, staggering injustice, oppression, terrible working conditions and death on an unimaginable scale? All the more reason to go and find out what it’s all about, we said. There’s a conical mountain that dominates Potosí, looming over it from almost every angle. For nearly 500 years Cerro Rico – or Rich Mountain – has been mined for silver, since the Spanish decided they’d like a piece of it in 1545. Back then, and for hundreds of years hence, the mountain yielded unfathomable riches. At its height Potosí was bigger and more important than London or Paris. Did Bolivia benefit? If you’ve ever read a word of colonial history, you’ll know the answer is a big fat, shiny, no. Not only that, but some 8 million miners lost their lives in the 300 years that the Spanish enslaved indigenous Bolivians and imported Africans to toil underground. Cerro Rico has been mined for nearly 500 years. It is known as the ‘mountain that eats men’. During colonial times people were, hardly surprisingly, petrified to go down there. They knew that only three in 10 of them would survive – if they didn’t perish in an accident, they would be poisoned by mercury, or die from dust-clogged lungs. Bolivians say that enough silver was extracted from Cerro Rico to build a bridge of silver between South America and Spain. The problem is, the flow of money across that ‘bridge’ was pretty much one way. In that respect Potosí is a microcosm of everything that was shameful about the colonial period itself, and how it paved the way for continuing exploitation. In this case it was the Spanish, but the same pattern applies in other continents thanks to the British, French, Dutch, Belgians, Italians, Portuguese and others. The Spanish came with their language, their religion, their diseases and their ideas of superiority. They saw glittery stuff and they wanted it. They brought misery and death to indigenous people on a staggering scale. They crushed ancient civilisations, siphoned off all the family silver and built their futures off the back of it, while ensuring that development in the colonies was stifled and dependency secured. “If it were not a futile exercise, Bolivia — now one of the world’s most poverty-stricken countries — could boast of having nourished the wealth of the wealthiest. And their mission to convert the indigenous people to Catholicism was helped along by the building of numerous lavish churches in the city, using the proceeds of slave labour in the mines. It’s said that although God ruled in Potosi’s 34 churches, the Devil laughed in his 6,000 mines. The ripples of those deliberate colonial-period policies are still very much felt throughout the world. 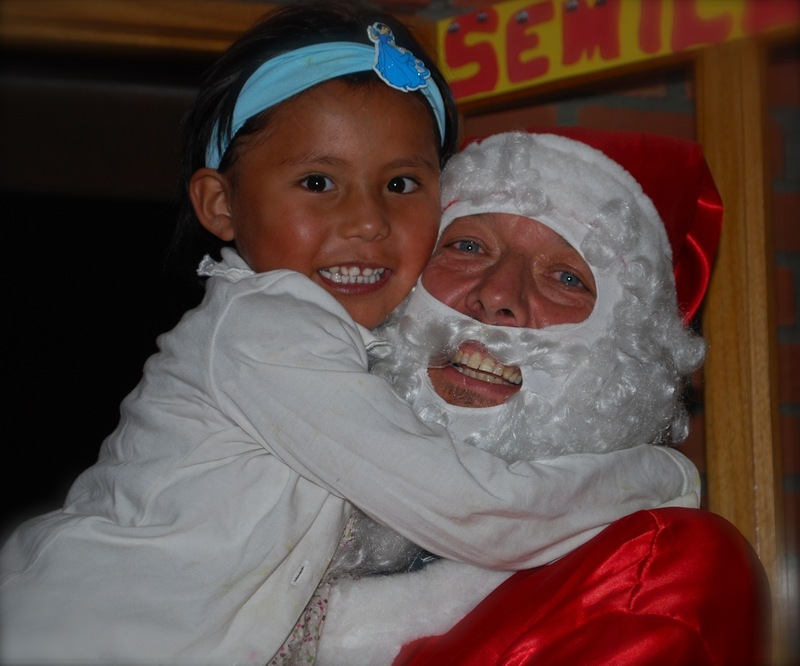 Today, the department of Potosí is one of the most poverty-stricken in Bolivia, and Bolivia is one of the poorest countries in South America. The Bolivian coins that were once made in Potosí are now manufactured in Chile, Canada and Spain. The previous day, at the spectacular Casa Real de la Moneda (the ‘royal mint’ house) museum, we had heard of a sunken Spanish galleon, which went down in 1622 full of Potosí silver coins. It was searched for and recovered off the coast of Florida by a US citizen, in 1985, containing an estimated $3billion worth of silver. Now, fair play to him for his efforts and all that. But when Potosí launched a claim to have their heritage returned to them, they received a donation of one coin. Yes, one. You can go and look at it in the museum or, if you like, buy one of the coins on eBay for hundreds of dollars. As for Cerro Rico, miners are still grafting in the mountain, which is now slowly collapsing after nearly half a millennium of extraction. For thousands of men from this region, and beyond, there is nothing else to do but mine. These days they are scratching a living from smaller and smaller veins of silver – plus lower value metals like tin and lead – in alarmingly primitive conditions. Modern equipment, safety gear and regulations appear to be luxuries no one can afford. Although progressive in many other ways, the Bolivian government has taken a hands-off approach to Cerro Rico’s mines, which they officially own but lease to a network of powerful co-operatives that apparently resist too much intervention. 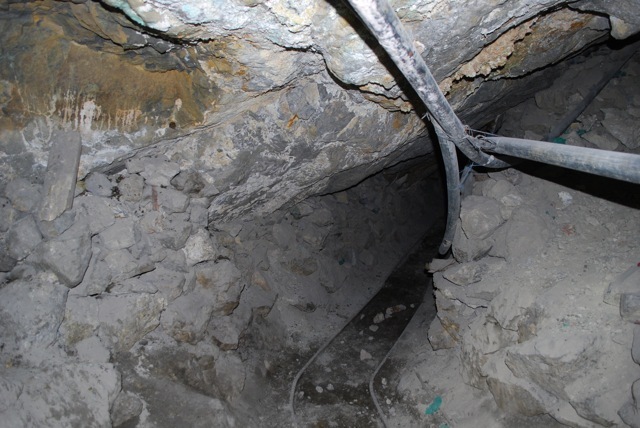 Most Cerro Rico miners will fall victim to the fatal lung disease silicosis after an average of 15 years of work, while collapses and other accidents also claim many lives. About 800-1,000 mine workers are children, whose families need the money. Miners of all ages often work horrendously long shifts, their cheeks distended with the coca leaves they chew to stave off hunger and exhaustion. It is possible to do a tour of the working mines and, after a bit of consideration, I decided to go down there. Jeremy declined, because he didn’t think he’d be able to tolerate the claustrophobic and cramped conditions. Signing the waiver before the tour was a stark reminder that the mines are genuinely dangerous and that there’s not much that can be done for you if there’s a collapse. It’s not an enjoyable experience, but that’s not the reason for going. I am not claustrophobic as such, but let’s say I’d put going caving very near to the bottom of my ‘to do’ list. I’d far rather jump out of a plane than squeeze into a dusty hole underground. It was Sunday 29 December, so there were not many miners working on the day we visited. This was, in some ways, a pity but in other ways it was far safer. Fewer explosions, and no rock-laden trolleys hurtling into our path. We headed into the darkness, splashing through cold muddy water and crouching to avoid jagged rocks, and low-slung pipes carrying compressed air. I smacked my head countless times. The level of the ‘roof’ changed constantly and the atmosphere, helmet, headlamps and darkness were phenomenally disorientating. After about 15 minutes, four people out of our group of seven had turned back. This is apparently quite common. The further in you go, the hotter and dustier it becomes. I started coughing as soon as we hit the dust, and yet most miners don’t wear masks. Before long we came across a lone miner, Basilio, who had been working in the mine for 28 years. I was astonished that he was allowed to work alone. Our guide Daniel said no one even keeps a list of who is working on any given day. Basilio was working only for himself – he needed the money so had come in while most people were taking a new year break. Most tourists bring ‘gifts’ of dynamite, coca leaves, cigarettes or drinks for the miners – we gave everything we’d bought to him. A lot of crouching is required.. He had let off some dynamite below and was waiting for the dust to clear. ‘Do you want to see where he is working?’, said Daniel. We did. It would require squeezing through a hole into the dusty abyss on the level below. We slipped and skidded, grabbed onto rocks that crumbled in our hands, and finally made it to the cave below. This was not your standard tour – it was horribly unsafe and because we had to go one-by-one we couldn’t help each other to get down. When we got to Basilio’s ‘space’ it was pretty horrifying – dark and cramped, with air so thick you could have sliced it. He was manually chiselling rocks to make holes for further dynamite explosions. He had apparently spent weeks carrying rocks to the level above, to make space to work. With every action he grunted and breathed in more dust, the sweat lashing off his brow. I was particularly fascinated by how the miners go to the toilet when they are down there for up to 24 hours. Apparently they just “pee anywhere” (“no2s outside”) but, astonishingly, there is no smell. Anyone who’s travelled in Latin America will remember the ubiquitous smell of urine, drying on sun-baked street corners. So how is it possible that millions of men have been peeing in an enclosed space for 500 years, without any discernable odour? Answers on a postcard please. Before heading out we crawled through a tiny tunnel to pay an obligatory visit to ‘Tio’. 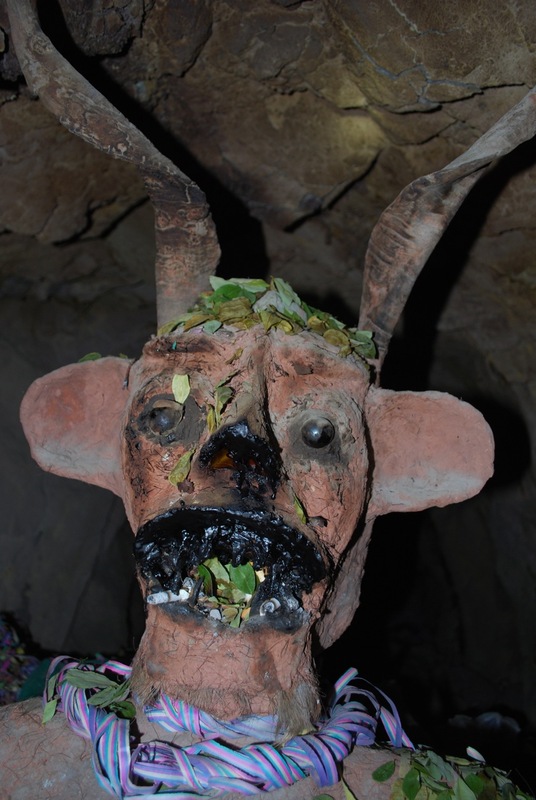 Every mine on Cerro Rico has its own Tio – an ugly cigarette-smoking statue with horns, an unmissable erection and very bad teeth, who represents the devil. Miners say they believe in God in the outside world, but when they enter the mountain they are in Satan’s territory. 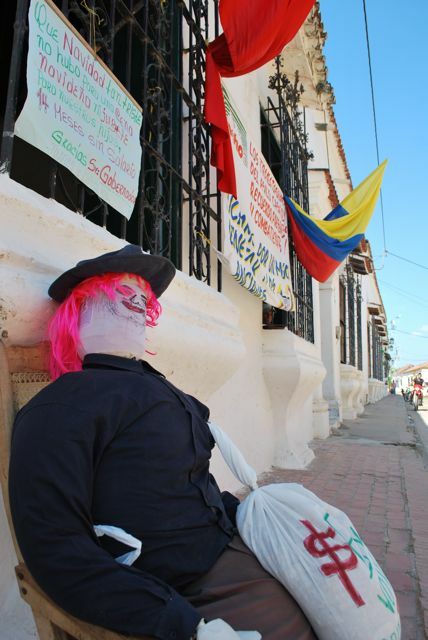 Tio is lavished with gifts like coca leaves and alcohol, so he’ll protect the miners and prevent accidents. ‘Tio’ is never short of cigarettes and coca leaves. There’s a well-known docu-film called the Devil’s Miner, which features two young brothers who worked in the mines. Among the most poignant scenes are those of the older brother (also called Basilio) trying to help the younger, Bernardino, become accustomed to this terrifying Tio statue, which they often visit alone in the darkness. Some people rightly ask why child labour is tolerated in the mines. It’s a complicated question but the Devil’s Miner provides a decent insight into how that can happen. Basilio and Bernardino were working on Cerro Rico to support their fatherless family. Their mother earned US$25 a month. Clothing her three children for school – with mandatory uniforms – cost nearly two months’ wages, so they needed more coming in if the kids were to get their education, and eat. So the boys crammed in their school lessons and a job in the mine into each day. “Going to school is like a vacation, even for half a day,” said Basilio, who was 14 when the film was made in 2005. This is despite the sad fact that other kids gave them abuse if they found out they were working in the mountain – calling them names like ‘rock thief’ and ‘dust sucker’. He hoped the job was only temporary. The reality is that the majority of child miners never leave Cerro Rico. 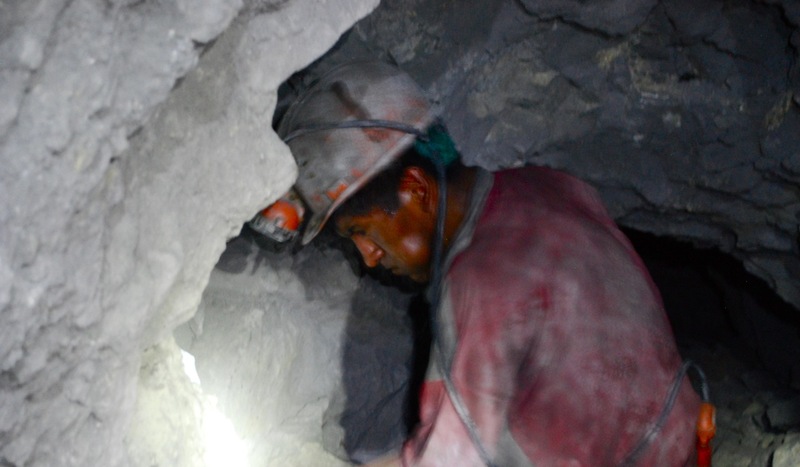 “But I don’t want to die in the mines, I want to live until I am big,” says Basilio. Luckily for them, a German NGO helped the family leave Cerro Rico and set up a small shop, selling kitchen utensils, in the town. Not everyone is so fortunate. Walking around Potosí, it is hard to imagine that death on a bigger scale than the Holocaust has visited these streets, and continues to stalk so many of the workers in the city. From a distance, Cerro Rico could be any one of the thousands of stunning mountains that dot the skylines of the Americas. But on closer examination, sadness seeps from its every pore. For an excellent analysis of the colonisation of the Americas and the exploitation that continued post-independence, we highly recommend The Open Veins of Latin America: Five centuries of the pillage of a continent, by Eduardo Galeano. Things we now know to be true: We will never know how it feels to work so you can live, while knowing it will kill you. Casa Real de la Moneda, or ‘Royal Mint’ Potosi – all the silver passed through here in colonial times and most was taken to Spain. 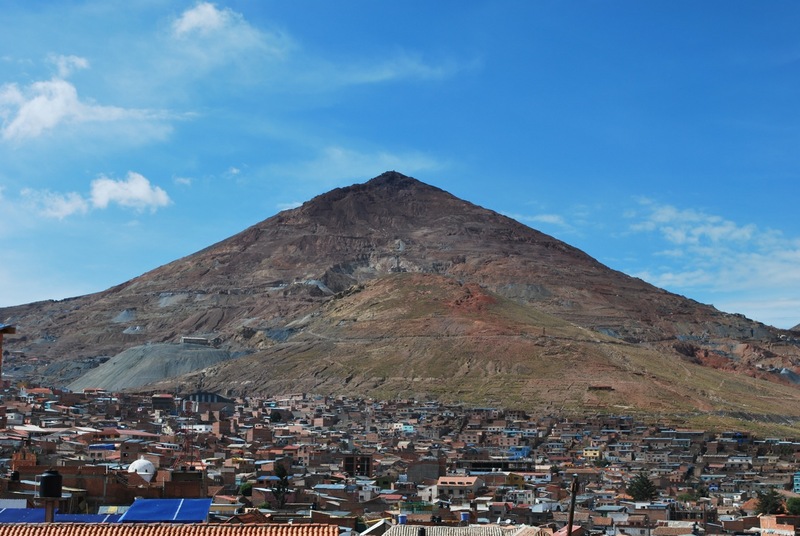 Cerro Rico can be seen from almost any angle in Potosi. 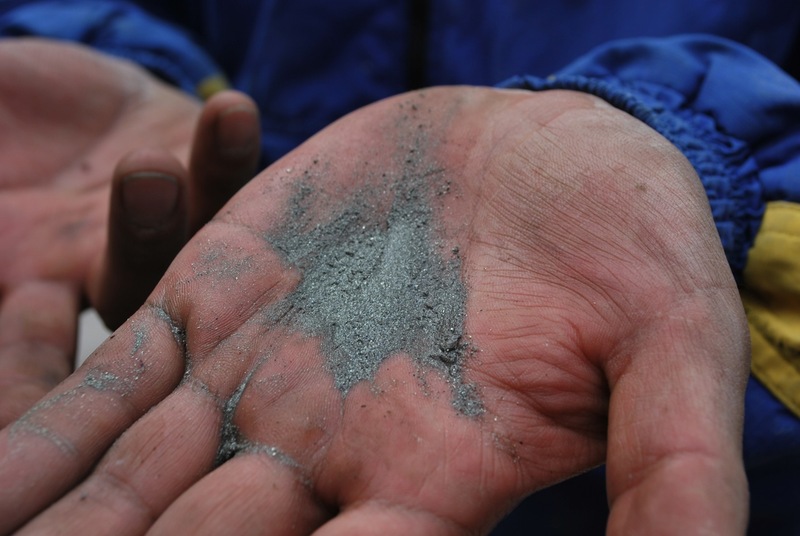 Cerro Rico’s silver goes through a basic process before being sold abroad for smelting. All set for the tour into the mine, Potosi. The miners use basic shelters, near the entrance to the mine, to change into their work gear. Our guide Daniel – his cheek bloated with coca leaves – gives a final explanation before we enter the mine. Basilio, and our guide Daniel, talk about his working conditions. Tio is a representation of a devil. The miners worship him while they are at work, believing he will protect them. Plaza 25 de Mayo, in beautiful Sucre. Iced coffees with a view, La Recoleta, Sucre. Getting the party going, New Year’s Eve, Sucre. Lining up the mojitos, New Year’s Eve, Sucre. New Year’s Eve cocktails, Sucre. Champers at midnight, 1 Jan 2014, Sucre, Bolivia. There’s only one word that can describe the last few weeks. Warm. Yes, as it happens we have discovered whole new levels of sweltering as Colombia’s dry season roasts everything in its path, but – much as we love to obsess about the weather – we’re talking about a different kind of warmth. We’d heard about it from many a traveller, but the collective hug of the Colombian people is really starting to reveal itself to us. In recent weeks we have received more good wishes and invitations to the homes of strangers than we have in a lifetime of travelling. It started with christmas. We were returning to our old favourite, the beach, to see out the festivities in as low key a way as possible. We don’t do xmas in a big way, but there are certain traditions that are just non-negotiable, such as eating and drinking to excess. We stocked up accordingly a few days before at a supermarket and on the way out popped into the pharmacy to see about an infection on my leg. The pharmacist gave me some ‘very strong’ antibiotics. Alarm bells rang. I examined the package and ask whether I could drink alcohol with them. “No!” she said, “it’s only five days though..”. “Ah, that’s a shame”, I replied, tucking the pills away til Boxing Day. We drove to Palomino, a beach on the Caribbean coast we had visited before, and parked up on the sand. Although technically a campsite, we were effectively camped right on the public beach, close to the access path from the village. This being peak season for domestic tourism there was a steady stream of Colombians, mainly from the chillier southern cities, coming on and off the beach and passing by our door. The van usually attracts quite a bit of interest, but suddenly we felt like the number one attraction. Over the next few days we were inundated with visitors asking about the van and wanting a look around. It’s not the world’s longest tour, but we are always happy to oblige. One woman even offered to buy it. We conducted umpteen tours and at one stage were videoed cooking and being interviewed by a huge family who were holidaying together. We appear to be spending a lot of time at the beach. We explained, as always, that there was a bed in the pop-top, but that it was a bit small for us and was better for children. 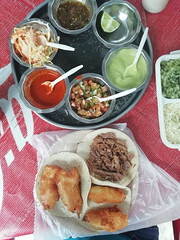 “But we don’t have children,” I said, pre-empting the inevitable question that seems to fascinate every Latin American (what, no children?!). “Here, you can have this one!”, laughed the mother, selecting a random child from the bunch. We politely declined. 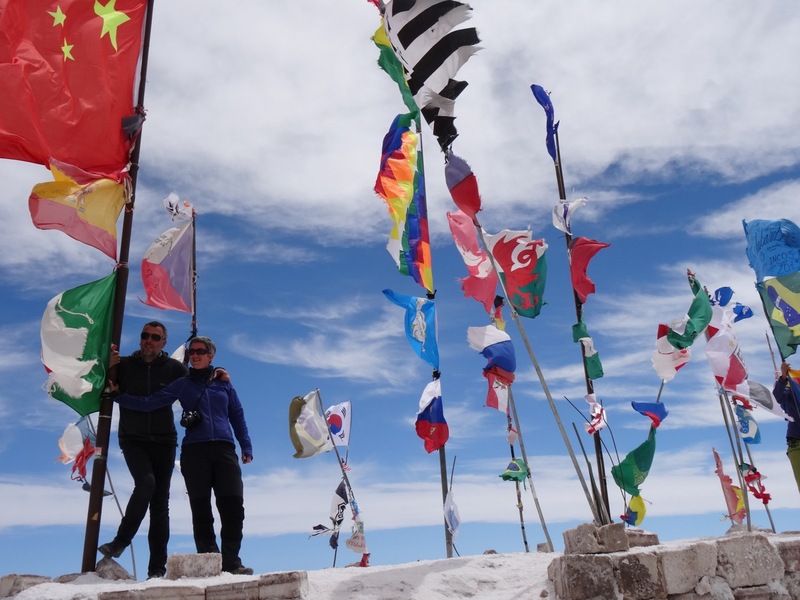 But what was most astonishing to us was the number of strangers who came by and asked whether we would be visiting their part of the country, then invited us to visit them when we arrived. It seemed only right to give a Caribbean twist to christmas, and on the day itself we feasted on barbequed jerk chicken, fried plantains, carrots sauteed in Jamaican ginger honey, and potatoes. We even pushed the boat out with one of my (not very Caribbean) banoffee pies. The festivities over, we faced the inevitable and, after a stop in Santa Marta, set off for the industrial city of Barranquilla to try to sort out a major lingering van-related issue – filling the propane tank, which we’d heard might be impossible in Colombia because of the particular fitting that foreign campers like ours have. We weren’t prepared to give up without a fight, and headed for the main propane plant in the city, our only hope. We came across this strike protest in Mompox – these health workers had been out for 14 months. We knocked on the gate and the guy came out. We explained our predicament, while he shook his head a lot, saying they didn’t have the right adaptor. We pleaded a little for any solution he could suggest. The next moment he disappeared and came back holding an adaptor. He screwed it onto our tank. Perfect fit, hurray! “Thank god, it fits”, he said, “but we still can’t fill your tank here” (they usually fill lorries, and the position of our tank was impossibly low). He told us to drive to the other side of the highway, pointing to a collection of dusty rudimentary buildings, and wait for him to meet us in his lunch hour. He would borrow the adaptor and see if his brother, who worked at a propane gas bottle shop, could help us. It all sounded a bit dodgy but we were desperate enough to give it a go. He turned up as promised, and he and several other guys set about trying to fill our tank from a bottle. We spent a hour lurching between hope and dejection, as they struggled to get it to work. The adaptor appeared to fit but was missing a vital element. As with so many occasions on this trip, we were bowled over by their refusal to just give in and send us packing. Eventually a piece of metal was sawn off something else, wedged (rather unsafely, we observed) into the adaptor and shoved in. Gas appeared to be trickling in, and after 20 minutes or so the tank was declared full. To be honest, none of us were totally sure if it had worked as the gauge doesn’t work, but we took their word for it and drove off in a celebratory mood. By the time we’d sorted out the problem it was late and we decided to just drive out of the city and get as far as possible before dark. We were heading south towards the Unesco world heritage site city of Mompóx for new year, about a 10 hour journey. As dusk fell, we scanned the roadside for a farm or something that might be happy to allow camping, and pulled in at one to ask. The guy suggested that we instead follow him down the road to a motel that he thought would have space for the van. As we arrived he had already asked the woman working there, and she enthusiastically invited us to pull in. It was a grim looking place, but by this stage we were keen to just stop and were too polite to make our excuses and run. I asked about toilets and she showed me to one of their rooms. She patted the damp, heavily-stained bed as we walked in, then proceeded to rub two raw cables together to try to get the light bulb to work. There was a toilet for our use, but no running water, and cockroaches were scuttling about in a panic, as if shocked that someone had actually turned up. Hopefully my face did not reveal my thoughts. Mompox is tricky to get to but worth the pain. “Rancid hellspawn” is one of Jeremy’s favourite phrases for describing the worst places we come across on our travels, but it’s a phrase he uses very sparingly. The words did pass his lips that night. In contrast, the woman working there could not have been nicer. She twice fed us food she had brought from home including the most delicious, anise-infused, arepas we have tasted to date, and quizzed us enthusiastically about our trip. However we were pleased to pull out early the next morning, and set off through cattle country in bright sunshine. 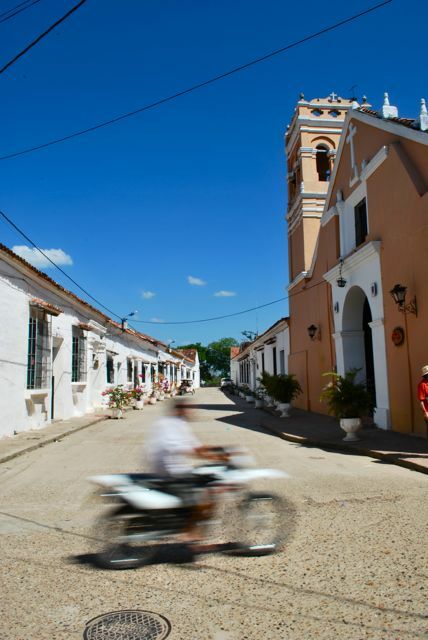 Mompóx is a gorgeous well-preserved colonial town which can only be reached by river ferry. We pulled in at the ‘dock’ – just a disturbingly steep dusty slope that plunged towards the river – which was packed with trucks and cars, this being the Saturday before new year. After a stiflingly hot 2 hour delay, tempers were starting to fray, especially when those who had been waiting for hours realised there may not be space on the ferry for everyone and some last-minute arrivals had been pushing into the queue. As we approached they put us to one side so we would be one of the last to board. This provided the biggest audience possible for Jeremy, who had to reverse/slip down onto the ferry and into an impossibly small space between the barrier and another car. At one point two officials were shouting completely contrasting directions at him and several other passengers were chipping in. I nearly throttled the obligatory drunk guy who was leaning in the window and telling us to remain calm. 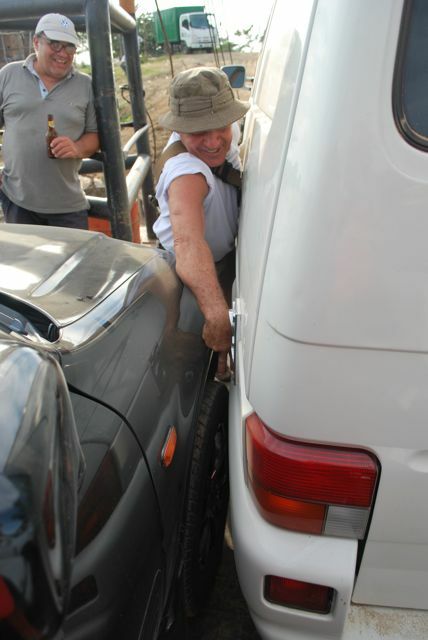 Our tyre screeched off the barrier as we wedged ourselves in, but we were still hanging over the hinge for the pull-up door. A fellow passenger helpfully demonstrates he can barely get two fingers between our two cars on the ferry. “What will happen to the front of the van when the door is closed?”, I asked a fellow passenger. “Oh they don’t close it, they’ll put 7 or 8 motorbikes on there before we leave!” he replied. Silly of me to worry. 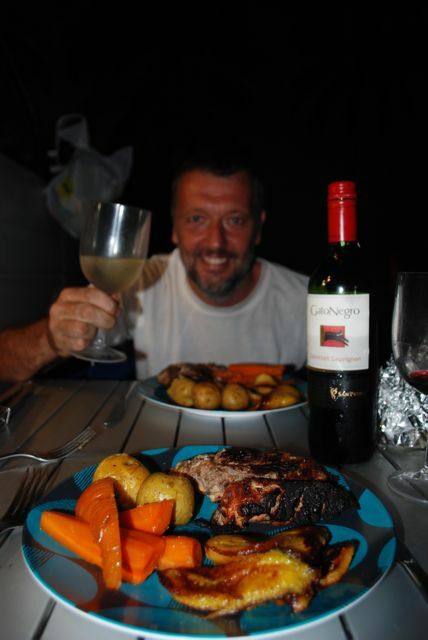 After arriving in the dark we free-camped in a riverside park in the centre of Mompóx that night, which was already in pretty festive mood, complete with banging speakers on every corner. We awoke at sunrise the next day to the sounds of the adjacent football pitch being set up for the big Sunday game! As we were parked directly behind the goal, it seemed like a good time to move on, and for a couple of nights we retreated to an edge-of-town camping spot. It was good to be somewhere with a bit of culture again. Mompóx, formerly a trading post dripping with wealth, now has that isolated old-world feel. We wandered the baking streets by daytime but could only take the temperature for short bursts. Mercifully, there was a pool where we were camping but even this was warm. “Is nothing cold?” asked Jeremy. It seemed not – there was even a town-wide ice shortage on new year’s eve. Ice is just as commonly sold from people’s houses as from shops here, and I was sent from door to door to door, searching for the cold stuff. ‘None left here! 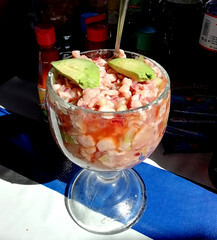 Try the red house on the corner….’ and so it went on til we found the last bolsa in town. 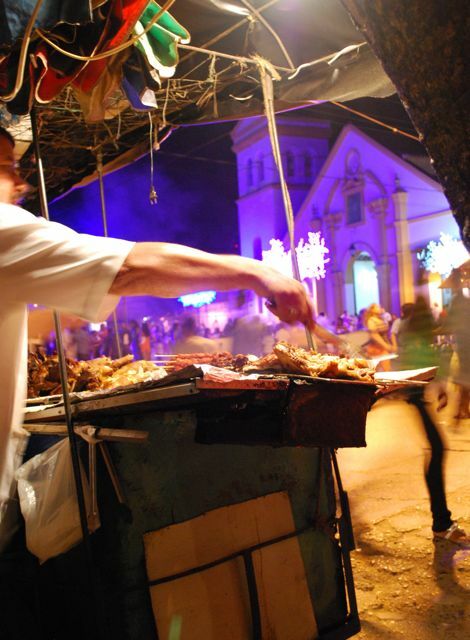 Waiting for our new year’s eve dinner to come off the grill, Mompox. Preliminary cold beers dealt with, we headed into town to wander some more and take in the atmosphere. Most families held their house parties out in the street, with their pavement speakers competing in both the size and volume stakes. The town’s many churches were packed, and families spilled out into squares filled with fairy lights. We ate a delicious plate of mixed meats from a street stall and even managed to find a cocktail for midnight. With the temperatures sizzling, our little 12-volt fan chose this time to stop working. To be honest we were amazed this $12 supermarket fan had lasted 15 months. But would we be able to find a new 12v car fan in Colombia? This episode highlighted one of the big beefs we have with most of the Western world – that when things break we can rarely get them repaired, even if we want to. Here, it is the opposite. Men sit at roadside stalls repairing mobile phones. There are shops for fixing cameras, cookers, food processors, you name it. We took the fan to a little shop and had it repaired in 3 minutes. I told the guy this would be difficult at home. “I heard about that! You just throw things away and buy a new one!” he said, shaking his head. 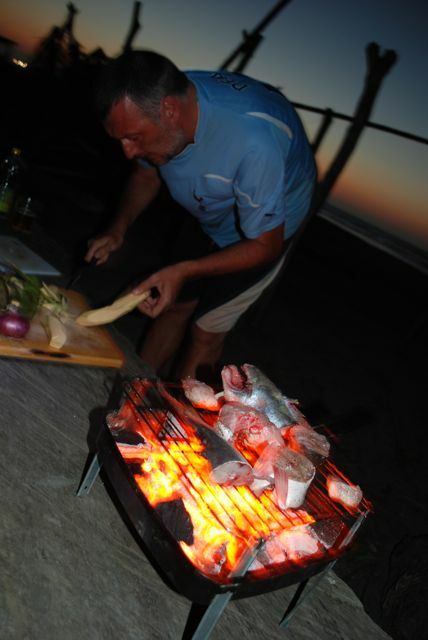 Chopping a ‘bagre de mar’ for dinner on the beach. After a calmer return ferry journey we headed north-west to a coastal area south of Cartagena, mostly visited by Colombians. We’re not sure why the gringos haven’t found this lovely stretch of coast. 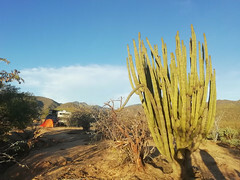 During two stops near Coveñas and San Bernardo del Viento, we were again on the receiving end of numerous good wishes for the trip and left with our notebook bursting with more addresses, including from one family who have a coffee roasting place near Medellín. Yum! 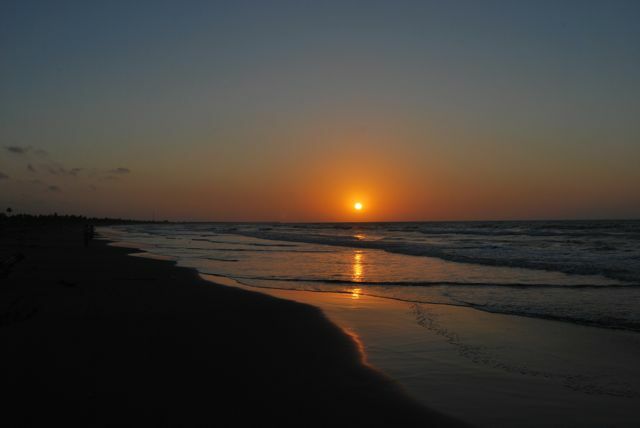 At the latter spot we wild-camped on a beach that was blissfully quiet following the music fests of Mompóx and Tolú. 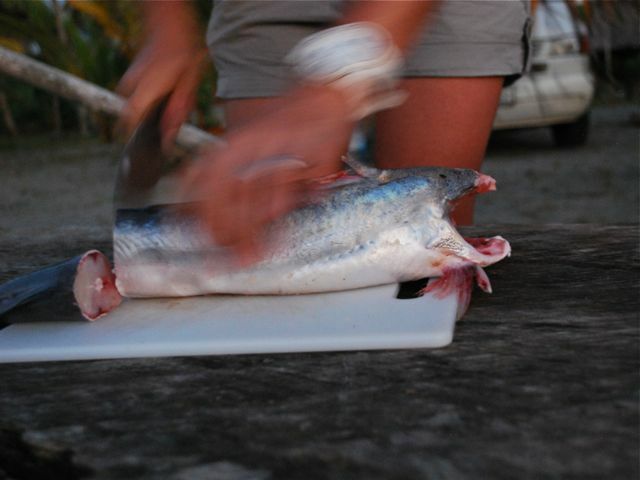 We flopped on the beach, buying fruit and fish from passing locals, including our first ‘bagre de mar’ (a type of catfish), a new favourite. We are waiting for our friend Caroline to fly into Cartagena soon and join us for a holiday, after which we will turn south towards Bogotá. It’s about time we hit some mountains and cities, else we are in serious danger of becoming full-time beach bums. As the altitude increases we’ll get some fresher weather too, but we feel sure of the warm welcome awaiting us further south. Things we now know to be wish were true: A quote from Jeremy this week: ‘Why hasn’t someone invented sand that doesn’t stick’?